Pulitzer Prize winner Junot Díaz reads “Boyfriend,” a short story from his 1997 collection, Drown. This recording is available for noncommercial and educational use only. All rights belong to the author. 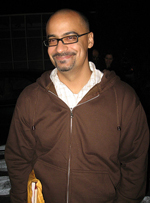 © 2008 Junot Díaz. Used with permission from Junot Díaz. Sharing these audio gems offers them a taste of literature in a way that invites them into the mystery and power of the written word, for their personal consumption.